Narda West's High Power PCS Band Duplexer Series provides highly selective receive/transmit combining. 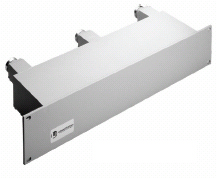 These Duplexers are designed to pass the full PCS receive and transmit bands while providing more than 60 dB isolation. Out-of-band rejection is 60 dB minimum from DC to 1825 MHz and >55 dB from 2015 to 2500 MHz. These units have 0.8 dB maximum passband insertion loss with 0.6 dB typical. This Duplexer has been specifically designed for high power applications. Power ratings are 500 Watts average/continuous duty with peak powers of 10 kW. Units have a passive intermodulation rating of -110 dBm with two 43 dBm carriers. Various options available on these include Indoor/Outdoor usage and DC Pass-Thru on Receive to Antenna port.